I always wake up listening to National Public Radio. I hear news—local, national, and international—and most important, I hear about the Maine weather. 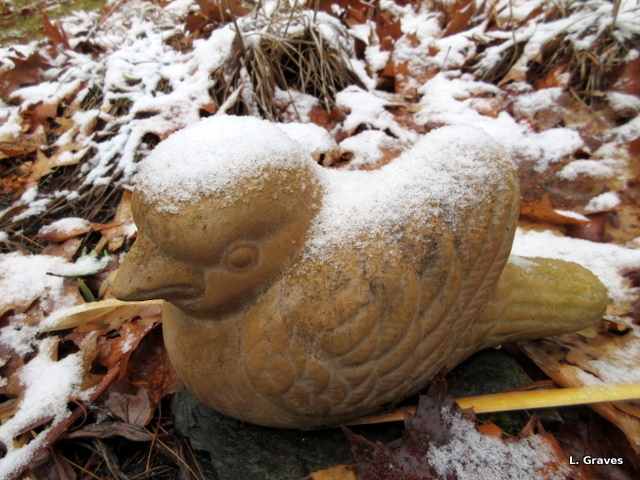 This morning I learned that there had been a dusting of snow in southern Maine. Technically, Clif and I live in central Maine, but geographically, we are more southern than central. I wondered, could we have gotten a dusting of snow, too? As soon as I got up, I pulled the shades and discovered yes, we had. 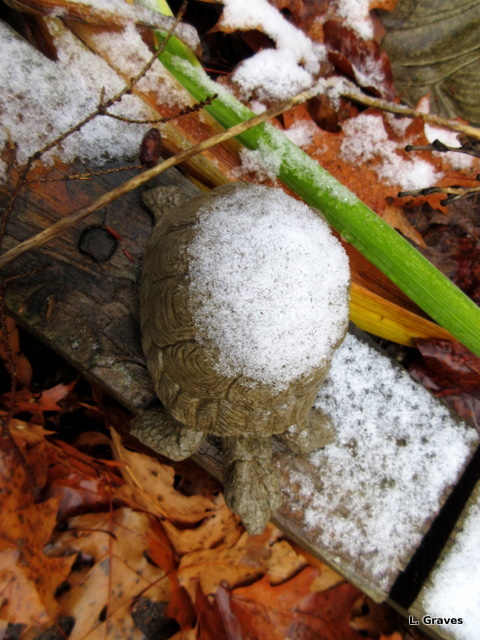 I had left some garden ornaments out for this very event, and I saw that snow caps covered their little heads. 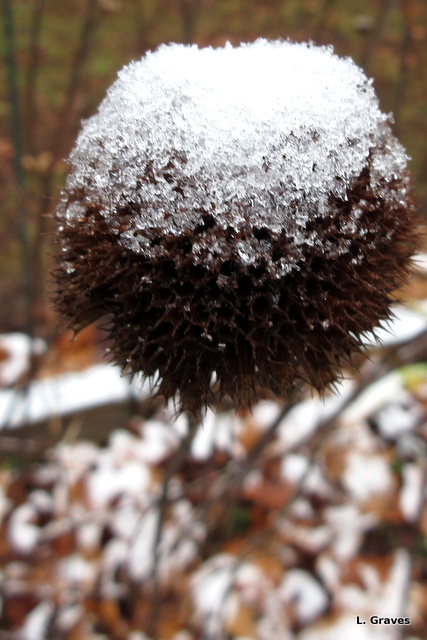 Also, some of the plants looked very fetching with an icing of snow. 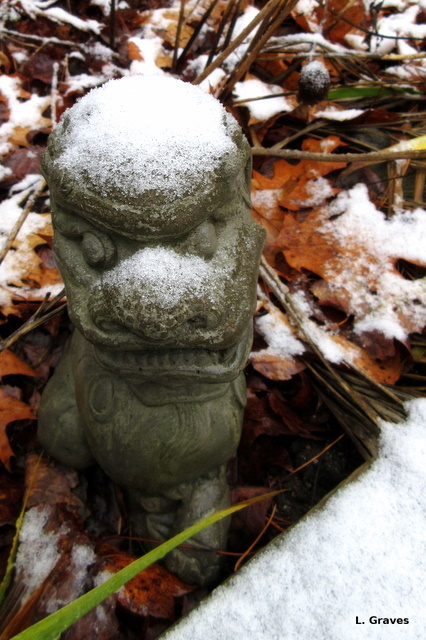 I so enjoy taking pictures of garden ornaments with a dusting of snow. They look solemn and stoic, and it appeals to my New England sensibility. I also got a couple of good pictures of plants in the snow, and I’ll be using the red berry and evergreen as a winter card. As much as I appreciated the warm weather, it does my heart good to see the Maine landscape look more like mid-November. Previous PostEndless Fall: Tea on the Patio on November 19Next PostHappy 2016 Thanksgiving! Hi Laurie, I just discovered you from your comment to Susan Branch and your blog is my second time to ever respond to one but I wanted you to know you have a new suscriber from s. California. I looovee Maine. I have a very dear friend who lived in Cherryfield and I teach with a young woman from that area… I have only visited once in the fall about 30 years ago and I will never forget that trip. Your photos are so pretty. Last night we had rain. What a blessing! How lovely! So glad you commented and have subscribed to my blog. It’s funny how things ripple outward. I almost didn’t comment on Susan’s blog because she got so many comments, and I didn’t want to burden her. But I also wanted her to know I supported her. I am glad I did. Maine is a lovely state, and I take pictures of central Maine, where I live, throughout the year. Funny, but I have a friend in Cherryfield, too. And, it’s wonderful that you got rain. I know how dry it has been in southern California. Finally a little November weather. I love the wee duck. We don’t get much snow on the Fylde Coast, but 20-30 miles inland they’ve had a fair bit. It’s all gone again though. Thanks, Helen. We don’t always get snow in November, but generally the ground is hard and frozen. Now, it is green and soft. Very strange! Still, it was nice to see the snow. Thanks, Johanna! And a happy Thanksgiving to you and yours! I love how you described catching that first snow in pictures. 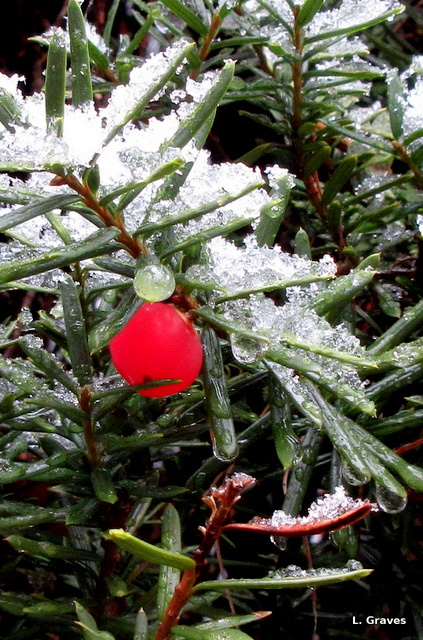 The yew berry is my favorite – great shot! 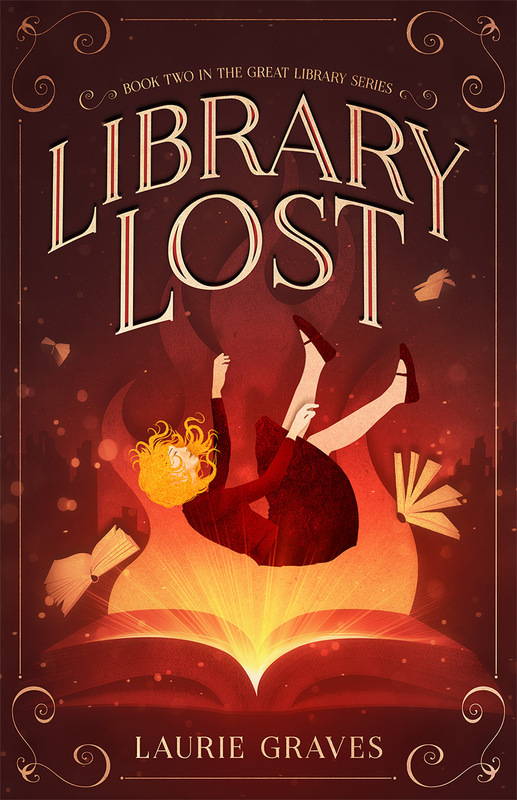 Thanks, Eliza! It will go into our photo-card file. We had about the same amount here. We’re enjoying the cold! Have a great Thanksgiving and slip Liam a little bit of turkey for me. Thanks, Brenda! And a happy Thanksgiving to you and yours. Liam will certainly get a bit of turkey, and I expect the same is true for little (?) Capp. No snow in Chicago yet but we arrived in Minneapolis yesterday to have Thanksgiving at my brother’s house and was greeted by a couple inches of wet, slushy snow. Have a happy holiday! Thanks, Jason! Hope yours was filled with good food and good company. Outstanding photos! Really warms my Maine heart all the way over here in Ireland. A dusting of snow! Four of my favourite words. Because I can handle a dusting alright. It’s the deep stuff that gets me…. Hope your Thanksgiving was loving and filling and kind. Awesome pics, well worth your sockless, early morning expedition! 🙂 Glad I’m catching up here – I guess I must’ve missed a few emails somehow. Take care.